3X21 The Running of the Bullfrogs! 3X24 A Dolphin Is a Guppy's Best Friend! 4X08 The New Year's Dragon! 2X06 Firefighter Gil to the Rescue! 3X04 The Super Ballet Bowl! 3X05 The Wizard of Oz-tralia! 3X09 The Amusement Parking Lot! 3X10 Good Morning, Mr. Grumpfish! 3X12 The Unidentified Flying Orchestra! 3X13 Come to Your Senses! 1X04 Build Me a Building! 1X05 Ducks in a Row! 1X08 Who's Gonna Play the Big Bad Wolf? 3X19 A Very Guppy Christmas! 1X12 Gup, Gup and Away! 1X13 The Spring Chicken is Coming! 1X18 Can You Dig It? 2X07 A Tooth on the Looth! La trama presenta la vida de seis pequeños sirenos de entre 4 y 5 años que viven en un lugar ficticio del océano llamado Bubbletucky. 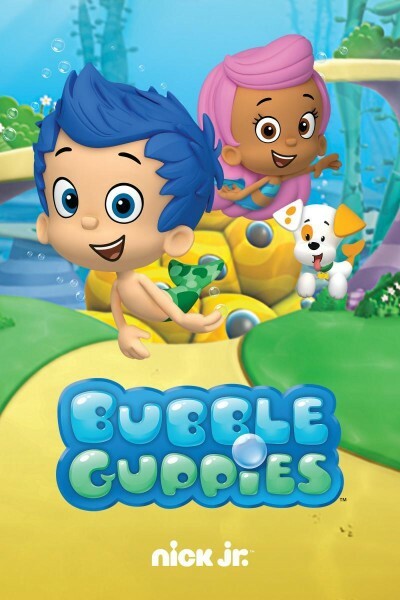 En la escuela, estos seis "bubble guppies" imaginan increíbles y cómicas aventuras con las cuales aprenden un montón de cosas. Who's Gonna Play the Big Bad Wolf? The Running of the Bullfrogs!